There's really no difference but you could check the serial number of the movement to see when it was made. I like to use this database... http://pocketwatchdatabase.com but for 987A's you need to remember the first figure is an O (as in oh) and not a zero. I can tell you that the production of red-faced and blue-faced dials was zero. Even black-dialed Martins are custom-refinishes. Only the silver butler finish was originally produced. I ask that you take a look at ebay item number 140989621307 and tell me what you think. Thank you. The dial is a custom refinish. Its not original but if you like the color, who cares if it's not original. The seller isn't claiming it to be original either. The Martin's biggest detractor is usually the wear to the front of the rounded lugs and this one looks pretty good, albeit the photos are blurry. There's not movement photo so there's no telling what condition the movement is in. I should clarify that the exception is the Coral Ross, which has a slightly different pinkish-shaded dial with white rhodium plated numbers. Thanks for your input. It would appear that it is a very high quality refinish. Even the tick marks around the seconds hand look perfect. I made an offer but haven't heard back. 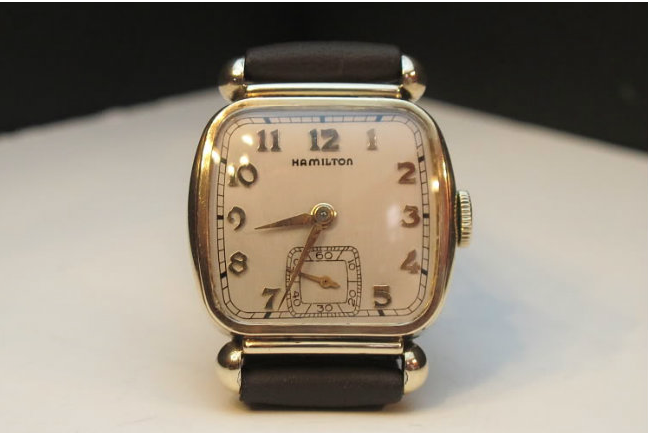 You can appreciate this: For Christmas My father gave me the first watch he ever purchased (he purchased it new) - his 1960 Hamilton T-403! It's in pretty good condition, with minor spotty wear thru of the 10K gold plating (only near the lugs). Now I don't want to wear any of my other Hamiltons! Question: What can you tell me about re-gold-plating a watch body? Thanks. The Martin takes a MY9-228 218. If you call a few parts houses they will probably have one. 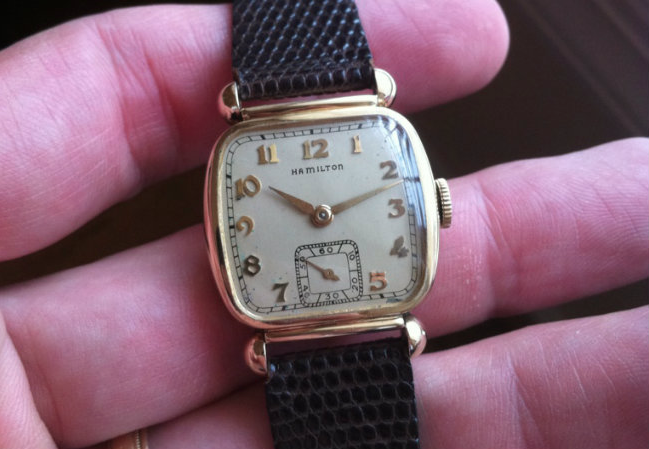 Did the pre-war watches have any style difference from the post-war ones? 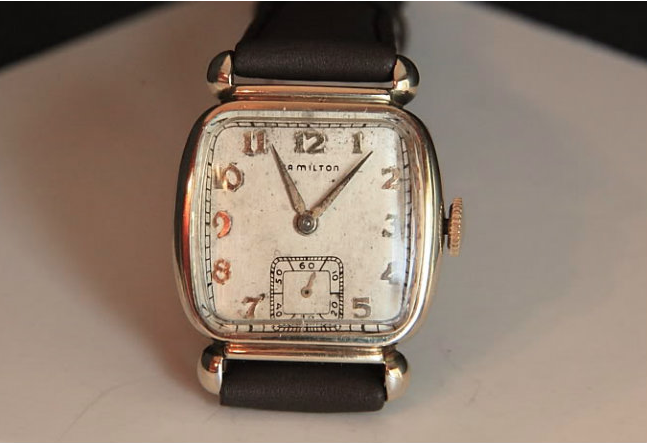 I have a vintage Hamilton that I believe is a Martin - the difference from those I see online is that the small dial does not have numerals - just bars. The face is a light brushed gold. Your thoughts would be appreciated! The Martin came in yellow gold filled or coral (rose) gold filled before the war but just yellow after the war. Sounds like your dial is a slightly incorrect refinish. It should have numbers in the seconds register. My watch has me quite confused. The case is a 10K gold filled Martin, but the movement is a 19j 979 with a serial number of 2900353 which comes up as 1928-29. Do you have any ideas? The face has the gold numbers but they are smaller than those in your photos above. The movement is an obvious replacement. The dial may be too - I'd have to see it to be sure. The shape of the seconds register is a good clue - does it match the Martin's shape? The good news is the 979 is a valuable and sought after movement, especially if it's in good shape. They often will sell on their own for almost $200. It would be easy to find a nice 987A to drop in it's place - as the Martin is a very common model. I can't seem to upload a photo, but the seconds register does match the Martin's shape. This was my grandfather's watch. He passed away in 1991. I'm pretty sure he had the watch back in the late 60s/early 70s when I can remember playing with it as a kid. In fact, it was in a box with my grandma's costume jewelry when I rediscovered it around 2000. I wish they were around to tell me how this combo came about. What do you think is the case style for the 979 movement? The 979 was used in a variety of solid gold models in the late 1920's and early '30s. It could be from any of them. There's no way to say without the dial. You can send me a photo through my Etsy shop or using the "contact me by clicking here" above my photo in the upper right.